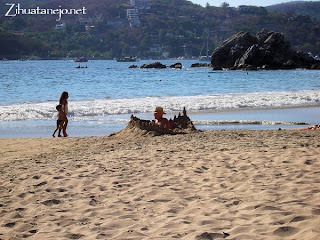 Zihuatanejo-Ixtapa, Mexico: Scaring Zihuatanejo's Tourists? It has been commented upon more than once (mostly by folks with an axe to grind or a personal agenda or who are trying to sell you something) that I am scaring away tourists from Zihuatanejo-Ixtapa by writing (or in their words "sensationalizing") about things like our crime and pollution problems as well as the recent discussion about the shark incidents. Some rather simple-minded folks actually blame me for the decline in local tourism, as if it were me, not the crime and pollution and other problems, that were causing concern and anxiety among our visitors, both nationals and foreigners. Well, I am certainly not trying to sell anyone anything, that's for sure, since I believe Zihuatanejo sells itself but that it also isn't for everyone. It is unfortunate that there are folks (mostly clueless wonder travel agents looking for their commission and public officials looking to create a favorable impression for their resumé) who attempt to mass market Zihuatanejo as if it were competing for the same tourists that go to Puerto Vallarta, Cancún or Acapulco, while ignoring our very real and growing problems. But the fact is that Zihuatanejo is nothing like those places and its inhabitants do not aspire for it to be so. Acapulco is everything Zihuatanejo doesn't want to be! Tourists who look for the experiences offered by those places would usually be most bored and unhappy in Zihuatanejo as well as make us unhappy here with their raucous and complaining presence. Zihuatanejo is still (though just barely) about enjoying peacefulness, communing with nature in a healthy environment and immersing oneself in the local culture. Unfortunately, the people responsible for ensuring that Zihuatanejo remains peaceful, safe and that its natural attractions as well as our town remain clean and pristine have let us down. It certainly isn't my fault there is crime and pollution, but some people would prefer our visitors came here completely unaware of these things, and if something unfortunate happens to them it should be played down, certainly not discussed in public forums or written up in the press. Well, I don't agree with that propagandistic paint-a-rosy-picture-at-all-costs thinking at all. I think our visitors have a right to make informed decisions based on honest and reliable information, and that it would be MUCH more productive for our community and our visitors if the "responsible authorities" actually attended to our numerous too-long-ignored problems instead of continually trying to cover up and ignore them while seeking votes and public appointments for the next elections. I wonder how many garbage cans could have been placed on our beaches for the same amount of money our local government wasted to place a religious statue on the bottom of Zihuatanejo Bay and the accompanying trip by the mayor to the Vatican with friends and family to get a miniature version of the statue blessed? I wonder how beautiful our bay and beaches would be if instead of fomenting land invasions to accumulate enough votes to win elections and then spending scarce resources on "popular projects" trying to provide public services to those non-taxpaying land thieves our "responsible authorities" had spent their energies and our meager resources to improve our sewage treatment plants? I wonder how effective our police forces would be if instead of being underpaid, undertrained, under-equipped and often on the payroll of organized crime themselves, they were provided the necessary support to actually keep our streets safe for citizens and visitors? I wonder how attractive Zihuatanejo would be if people who threw garbage in streets and gullies were actually fined for littering, if our garbage trucks didn't leak fetid black ooze on their daily rounds so that our streets didn't smell like sewers, if construction regulations were actually enforced, if ecocide and building violations by developers were actually sanctioned, if city planning were based on ecological sustainability and aesthetics instead of corruption and personal ambitions, if traffic regulations and ecological laws were actually enforced? What a different community and vacation destination this would be! I believe it's time for the folks who make the most money from our tourism (aka the lodging providers) to step up to the plate and light a fire under our responsible authorities' collective asses to deal with our problems instead of working so fervently to cover them up. It is an election year and now is when they can play an important role in improving the community where they make so much money by speaking out and making their own concerns known publically as well as by putting their money and support behind candidates who will actually attend to our community's problems instead of pandering to populism. But as long as we have public servants more interested in serving themselves than simply doing the jobs they were elected and appointed to do, then Zihuatanejo will remain a lawless and dirty town with chaotic growth and all its accompanying problems, and nothing I write here will make a hoot of a difference since all our tourists are not deaf, dumb and blind (though a few pretend to be for the sake of argument), and one bad experience by a visitor means not only will they not return but they will also not recommend Zihuatanejo to their friends and family. Such comments by dissatisfied visitors increasingly make the papers every peak vacation season. Though it breaks my heart to read them as well as to be honest about our problems, I find it even more reprehensible that the people with the power and the authority and the resources to correct our problems prefer to cover up these problems instead of acknowledging them and dealing with them. For example, it is simply criminal and unacceptable that there are no warning signs on the beach near the Boquita Canal or Las Salinas Lagoon warning bathers of the potential risk to their health by swimming in the waters near these well-known sources of pollution. It clearly demonstrates that the health and well-being of our visitors is not the primary concern of our municipal authorities. That is unacceptable! Once again I find myself referring to a most right-on quote by Phil in Toronto: "Garbage cans on the beaches would at least be symbolic!" I'm a little late posting here, but I found your blog through mine. This is a great article and I plan to link it on my blog. Same in Vallarta. It is now accurate to say that Puerto Vallarta is turning into Puerco Vallarta. Same ignorant, stupid, greedy and basically criminal fools, without conscience, principles or vision, who run things. "Pobre Mexico: tan lejos de Dios..."